Ditch the cords, gas and hassles... trim it the easy way! From finishing lawns to leveling tall field grass, this cordless rechargeable 9" string trimmer makes it quick, easy & convenient! Don't put up with tangled extension cords or the weight & mess of a gas powered model. Get this rechargeable string trimmer! 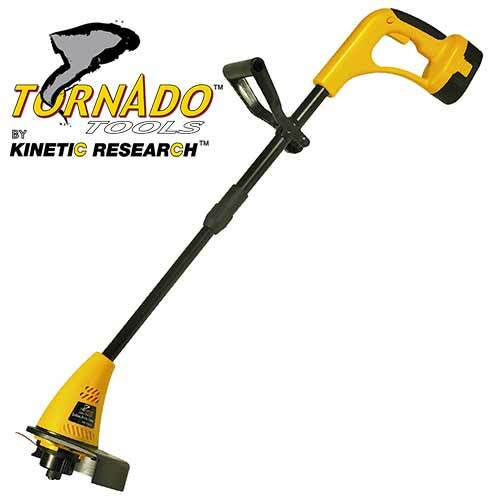 It has a wide 9" cutting path & an 8000 rpm motor to power through tall grass & weeds, an ergonomic handle & a reliable automatic string dispenser. Comes with 18V Ni-Cad battery pack with approx. 40 minutes run time per charge, 10 feet of line, adjustable length handle & charger adapter. This item is a Customer Return This is a customer return. Customer returned items have a 7 day return policy.